Rusk County Amateur Radio Club: Texas Parks On The Air a success! morning at Martin Creek State Park. 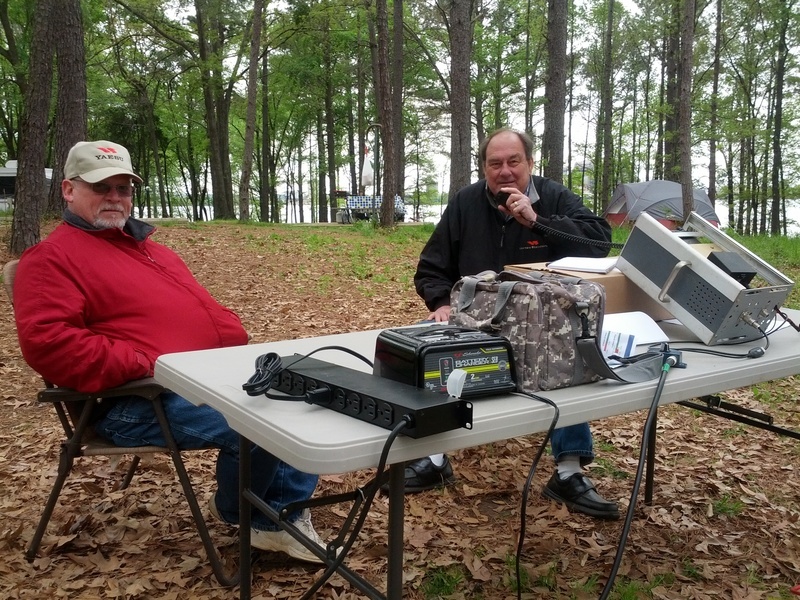 On April 5, 2014, members of the Rusk County Amateur Radio Club activated the Martin Creek Lake State Park for the Texas State Parks on the Air Contest. Five members of the RCARC club met at 8:00 a.m. Saturday morning to erect antennas and set up the amateur, “HAM” radio station on the shore of Martin Creek Lake. Guests at the adjoining campsites were curious as to why five grown men would be using a rod-n-reel to cast a fishing wait up and over as high a tree limb as we could manage. After explaining to them that we were planning to pull a length of wire up as high as possible to use as a radio antenna they knowingly nodded their heads and went back to their campsite, but they kept a watchful eye on their kids in case they happened got too close to what I’m sure seemed to them to be crazy radio guys. During the course of the contest club members worked other amateur radio stations in the Big Bend Ranch SP, Inks Lake SP, Lake Brownwood SP, Lake Whitney SP, Stephen F Austin SP, Government Canyon NA, and Goliad SP, as well as amateur stations in Arizona, Illinois, California and Canada. Several of the Martin Creek Lake State Park’s staff members stopped by to visit and say hello, and we really appreciate the park’s staff accommodating the Rusk County Amateur Radio Club’s visit to the park and participation in this contest. Contacts with the amateur stations in the other State Parks were made using 75 watts and an inverted Vee, wire antenna supported from a tree limb. Operation was battery powered which simulated an emergency, portable station. Amateur Radio operators across the United States use fun contest like this to practice their emergency response skills which often call for emergency communications without the use of normal AC power or large permanently installed antennas. The Rusk County Amateur Radio Club maintains a 2-meter, radio repeater in the Henderson, Texas area that will augment and support emergency communications during times of severe thunder storms, tornadic activity or other events when normal phone, cell phone, and public service radio communications may be over loaded or inactive.